Booster Hill is a large hill next to Booster Tower. This is the area Booster (with Princess Toadstool in tow) escapes to while trying to flee Mario during the events of Super Mario RPG: Legend of the Seven Stars. Booster takes the hill to flee to Marrymore, so that he can marry the princess. During the chase (and minigame) that ensues, Mario must avoid the barrels and Booster's Snifits, while running up the hill; jumping on them results in Mario getting a boost forward, but running into them results in him being sent falling backward. Clouds also occasionally fly across the screen, which obstruct the player's view. If Mario is able to reach Princess Toadstool, she gives him a Flower. Also, Booster Hill is the home of many Beetles; as a matter of fact, it, with its Beetle Race game, is the only place in which they can be found. If the player runs up the hill after leaving Marrymore but before buying a Beetle Box, the player has the opportunity to collect some Flowers. 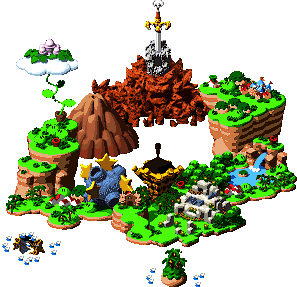 While running up the hill, many locations can be seen as silhouettes in the background, such as the Mushroom Kingdom, Bowser's Keep, and Barrel Volcano. This page was last edited on March 30, 2018, at 21:07.